♂ Observed near the rim of the Kongolai Escarpment, West Pokot, Kenya. July 2014. 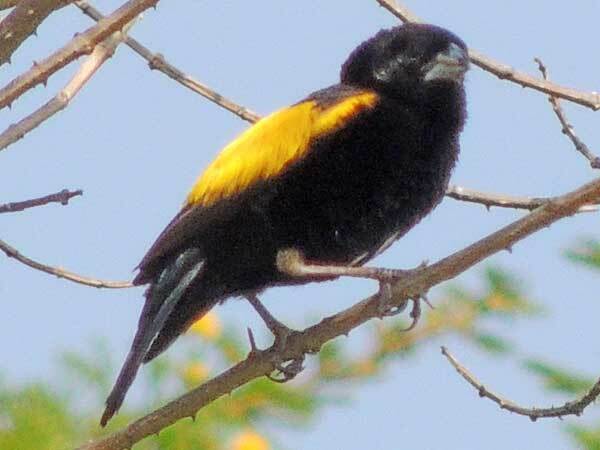 From Wikipedia: The yellow bishop is a stocky 15 cm long bird. The breeding male is black apart from his bright yellow lower back, rump, and shoulder patches, and brown edging to the wing feathers. He has a short crest, thick conical black bill, and a relatively short tail. His bill size varies dramatically between races. In non-breeding plumage, the black plumage is replaced by heavily streaked buffy-brown, and the bill is pale. The yellow shoulders and rump remain, and are a distinction from the female which lacks the contrasting colour patches. The juveniles and females are notoriously difficult to identify in the field, appearing identical to the juveniles and females of several other bishops and widowbirds as well as some seadeaters. Copyright Michael J. Plagens, page created 4 June 2015.